What do you get with the free version of PRTG? Before purchasing a license: Will the free version suffice? 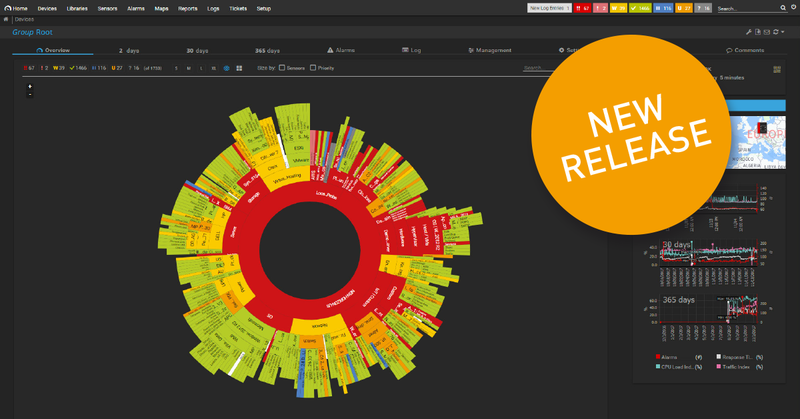 With the free version of PRTG, you get 100 sensors that never expire. 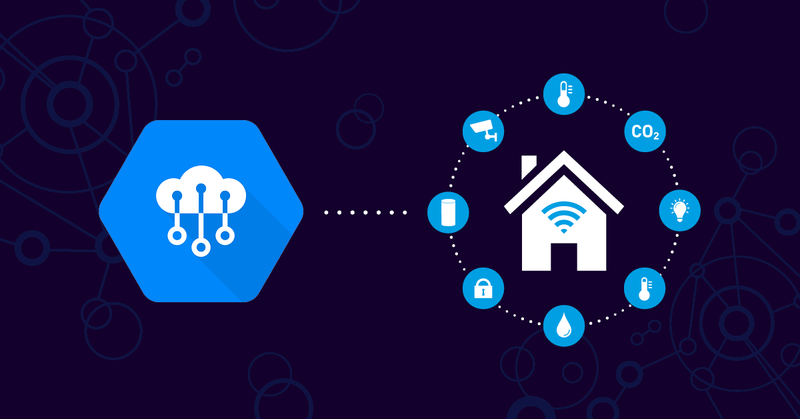 On average, you’ll need 10 sensors for each of your network devices. 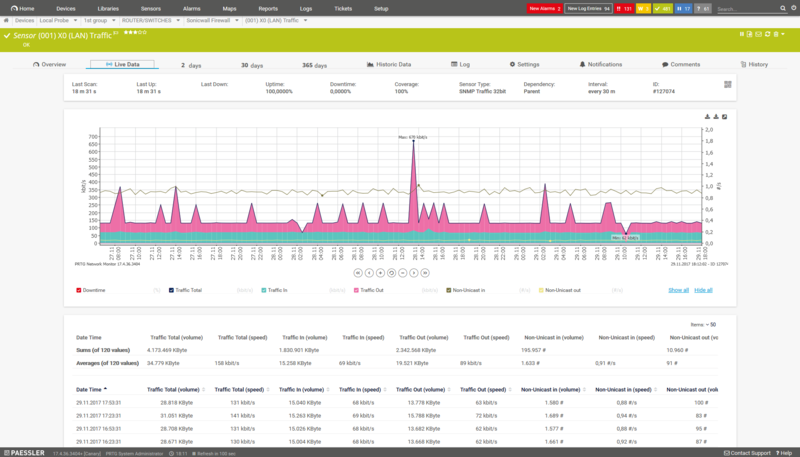 You can also choose to set up a much "lighter” monitoring environment – such as via the use of a single SNMP sensor to monitor traffic or one ping sensor for monitoring availability. Keep reading for tips on how to make the most of a free PRTG license, which comes with the alarm, reports, and dashboard functions, as well as mobile apps. The PRTG license model is based on the number of sensors you'll need to meet your requirements and expectations concerning your monitoring environment. You’re welcome to try the unlimited version of PRTG for 30 days for free. After this time, you’ll have access to only 100 free sensors. However, the trial will allow you to decide if you really need more sensors, and to subsequently choose the most suitable license. See all our prices here. 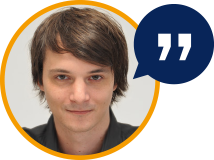 Before purchasing a license, find out where you stand – will our free network monitoring tool suffice? Many sysadmins are in charge of large networks. These networks are often associated with a great deal of bureaucratic hassle. It can, for example, take many weeks or even months to free up the money required for a professional network monitoring tool. At the same time, it’s important to get a good idea of what all the various tools on the market can do. 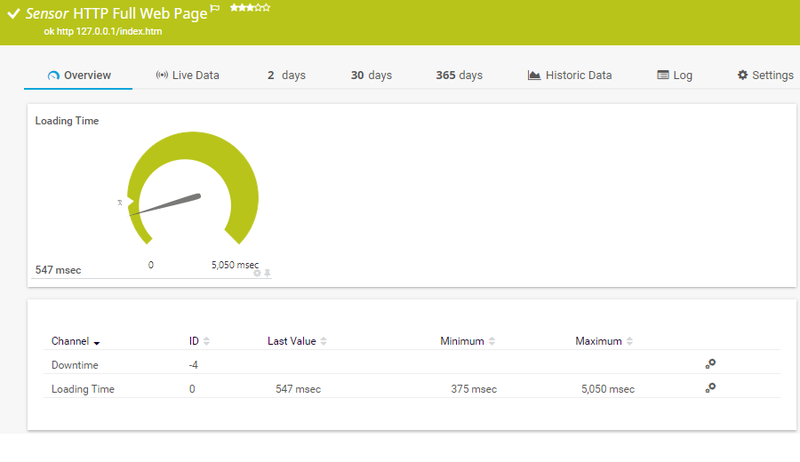 PRTG comes with a free 30-day trial, during which time you can use all the sensors you please. If in doubt, you can always just opt for the free 100-sensor license. Some sysadmins, on the other hand, work with relatively small networks. But these administrators also need professional monitoring software to ensure their network devices and applications are always up and running. 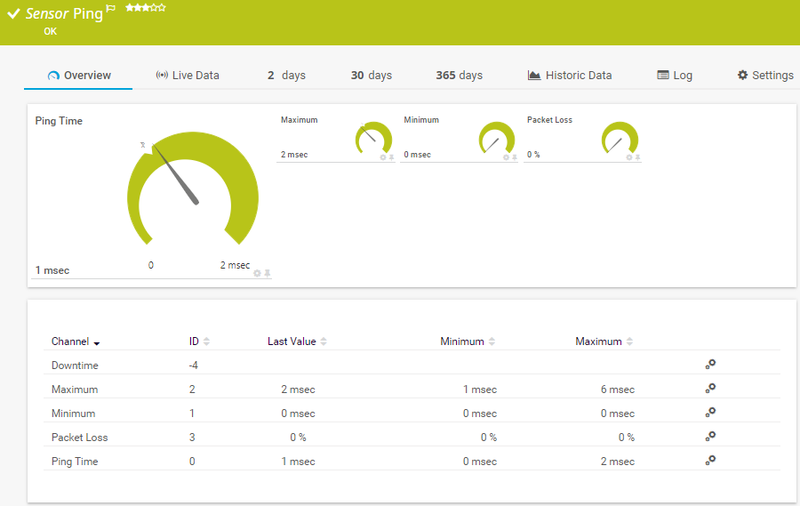 The 100-sensor version of PRTG allows these sysadmins to set up reliable network monitoring using freeware. Some admins also use PRTG at home to monitor their computers and end devices. There are countless freeware solutions as well as fee-based network monitoring tools. Some of these tools are used for specific purposes. For example, Angry IP Scanner is used to identify the devices that are in a network, while Wireshark provides you with detailed information regarding the way traffic flows through a network. How is PRTG different? Special tools are used in a targeted manner to quickly analyze specific situations. 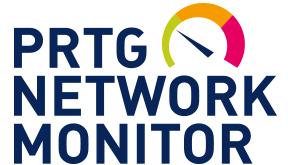 PRTG, on the other hand, monitors your network on a continual basis and notifies you in the event of problems. 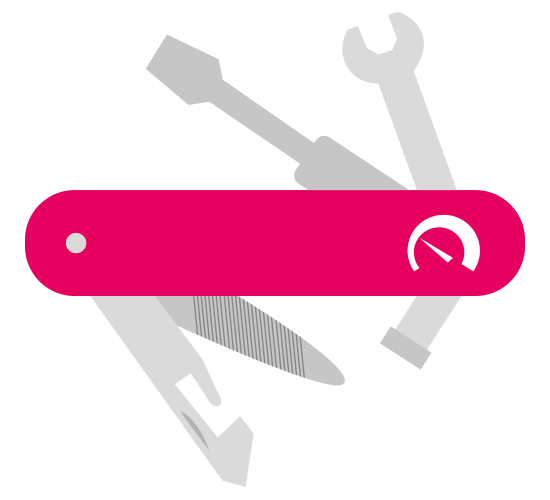 Often the solution to a network problem involves the use of both a special tool and PRTG. PRTG belongs to the class of large monitoring tools which allow you to set up comprehensive and continuous network monitoring. 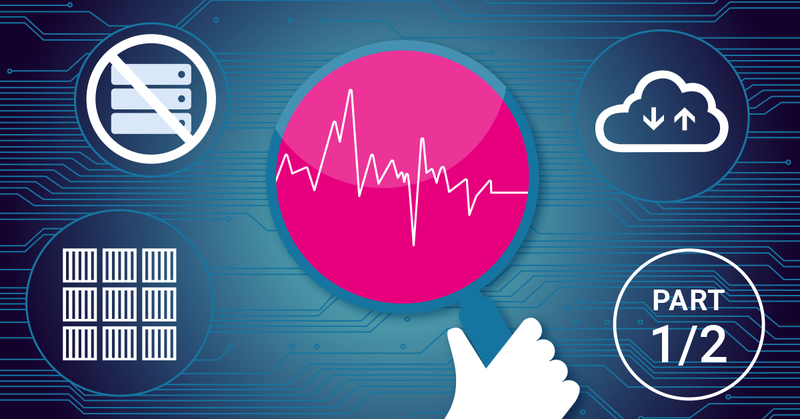 Monitoring tools monitor your network and sound the alarm in the event of an error or malfunction. IT managers often go with Nagios, SolarWinds, WhatsUp, or PRTG. 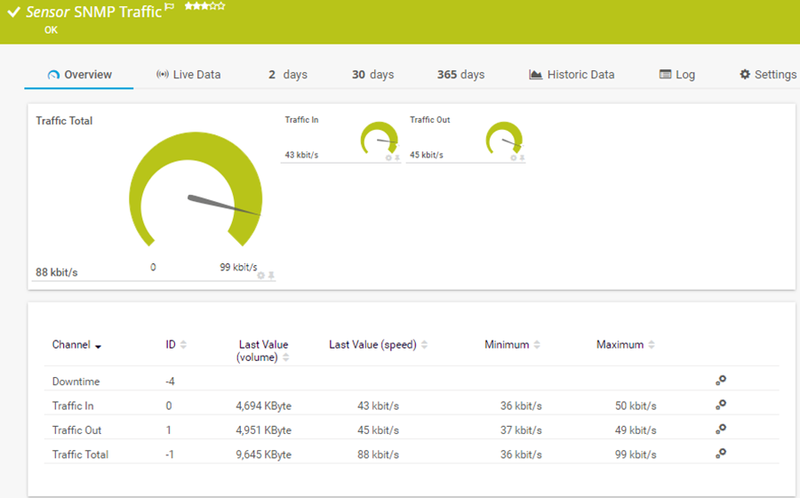 Find out how PRTG compares to SolarWinds and Nagios. The advantages of PRTG: quick to set up, easy to use, and all-inclusive. PRTG licenses: Are they worth it? We strive daily to ensure our network monitoring software facilitates the lives of system administrators around the world. 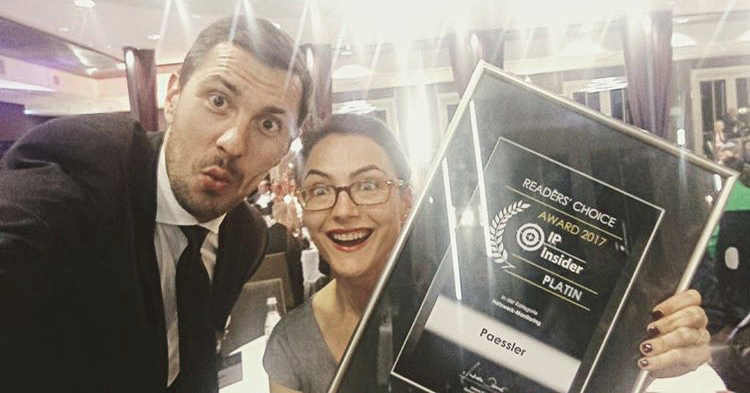 When we get a little recognition – such as from the readers of the IP insider portal – that strengthens our commitment even more. Hey Gerald, I’d like to set up free network monitoring with the 100-sensor version of PRTG. Any tips? In this first example, PRTG 100 is used as Syslog and SNMP Trap Receiver. 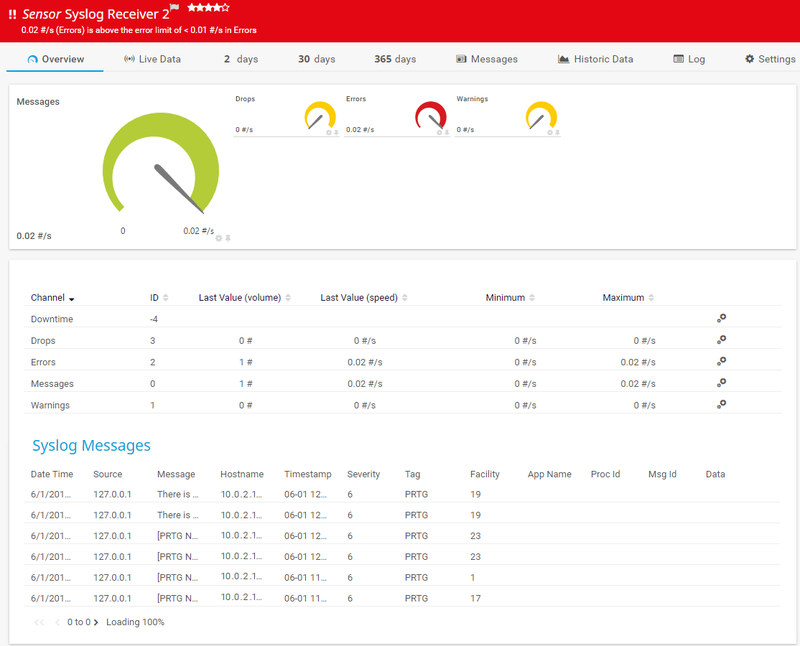 Syslogs and SNMP traps deliver a lot of information to devices in the form of text messages, which are delivered to a corresponding receiver. A single Syslog or Trap Receiver Sensor can theoretically be used to monitor an entire network: Under lab conditions (one single sensor without filters), PRTG could handle 10,000 messages per second (Syslog or trap) on a quad core desktop machine, so the software offers more than enough power reserves. The messages are collected and can be filtered and sorted, then serve as a basis for alerts, notifications and reports. You’re left with 99 sensors that can be used as Syslog and SNMP trap receivers for individual, important devices or for other purposes entirely. A website is a company's business card, showcase and retail outlet. However, if just entering a shop takes too long, most customers won’t even come in. Constant, comprehensive monitoring is necessary in order to guarantee fast response times and general availability of a website. 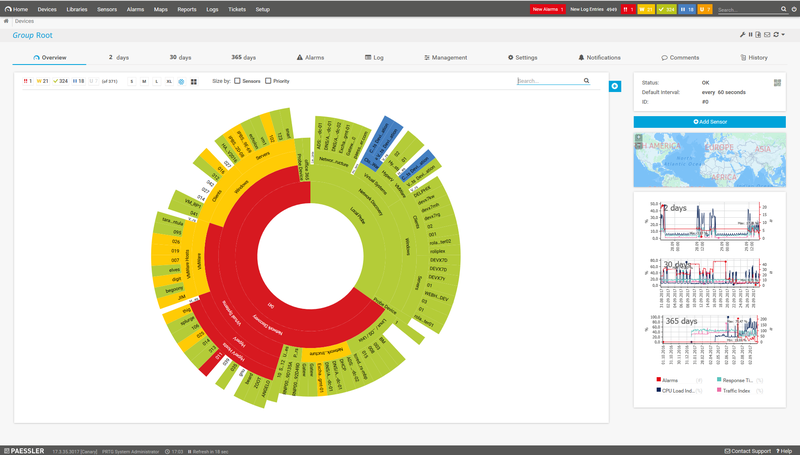 With 100 sensors, the free version offers enough options for comprehensive monitoring of one or more websites. For example, the HTTP sensor can be used to monitor general availability, while the HTTP Full Web Page sensor measures the time needed to load an entire page. One can monitor specific website content for changes, or use the HTTP Transaction sensor to monitor processes like logins or filling out and sending forms. Because PRTG 100 also includes remote probes, these can be distributed worldwide to monitor the availability and reaction time of websites from other countries. Website operators can ensure that their sites are available for international customers as well. In addition, some sensors can be used to monitor the web server or backup processes, for example. Email is still the main means of communication in most companies. Any disturbances in email traffic can have grave consequences. Consistent monitoring sends alerts before interruptions or failures occur and cause severe damage. 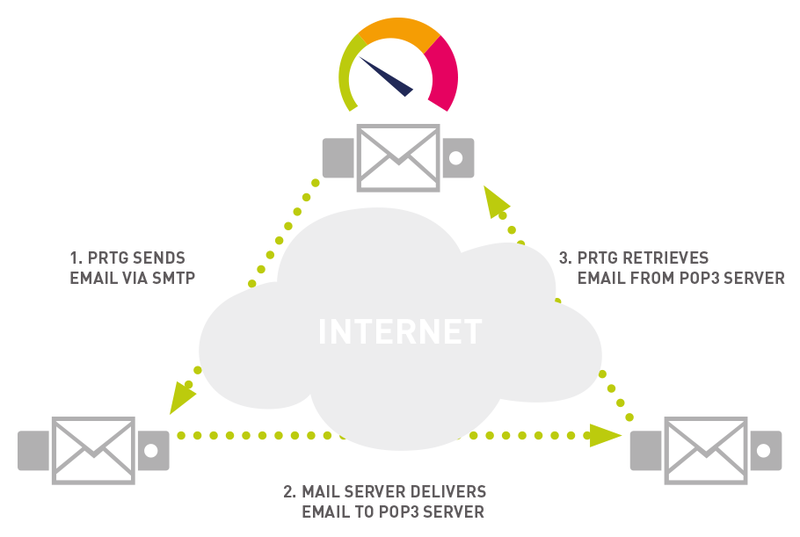 PRTG offers numerous predefined sensors for securing email traffic, including the Email Round Trip Sensors, which monitor the entire sending and receiving cycle of an email. In addition, dedicated Exchange, IMAP, POP or SMTP sensors can be used to monitor single key components efficiently and thoroughly. Databases are another critical point in many companies. Whether internal systems or websites, the performance of many processes is directly dependent on the performance of the underlying database. PRTG 100 offers predefined SQL sensors (MySQL, Microsoft SQL, ADO SQL and Oracle SQL) for in-depth SQL database monitoring. To this end, one sensor monitors various standard parameters, while still permitting custom SQL queries, so that the monitoring can easily be adjusted to fit individual requirements. One sensor that monitors the toner levels, queue, paper, etc. 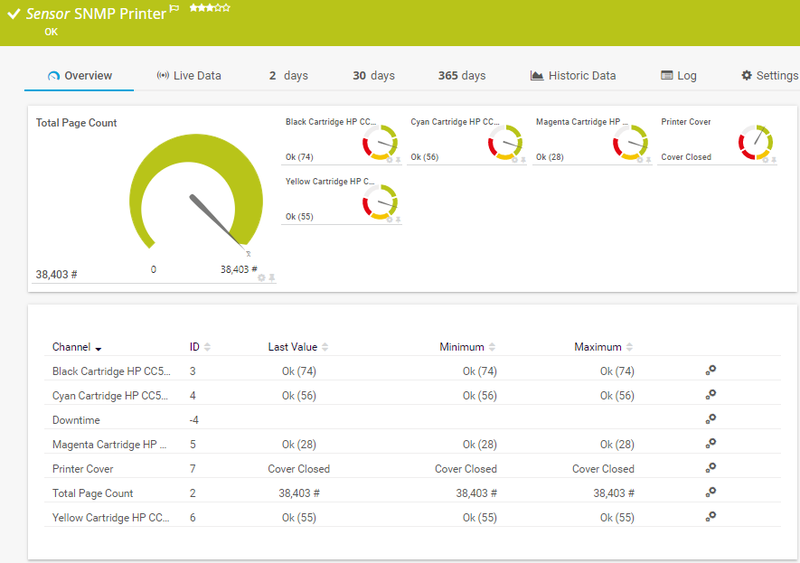 With the PRTG Maps feature – which involves easy-to-create HTML pages – printers can be displayed on a blueprint of the office, so the administrator immediately knows where the printer needing maintenance is located. The internal ticketing system can be used to create tickets and assign them directly to the responsible colleague. In addition, the free PRTG 100 can be used as a free and powerful alternative for some scenarios that, at first glance, seem to require expensive special solutions. Functions that are usually available for purchase as add-ons for other standard monitoring solutions are included in PRTG. PRTG 100 can be used in a small scope to monitor routers and switches using flow protocol. 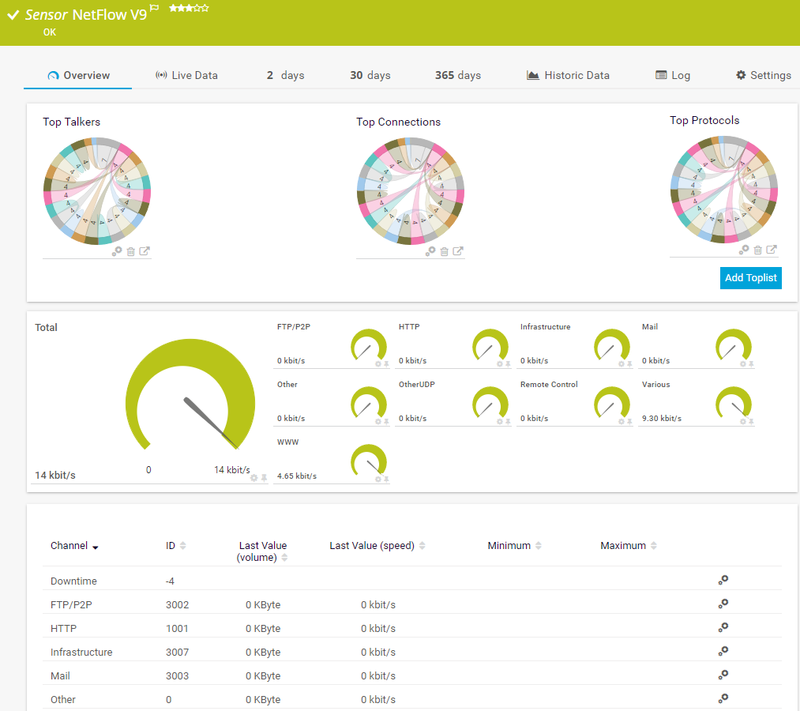 A flow sensor (PRTG supports NetFlow, sFlow, jFlow and IPFIX) processes a flow stream from a router or switch. In this way, the free PRTG version can monitor up to 100 flow-capable devices for free and analyzes the traffic that runs on these devices. PRTG does not aim to replace highly specialized flow solutions with its flow sensors, but helps administrators to maintain a quick overview of top talkers, top protocols and top connections in day-to-day work. Like flow monitoring, monitoring VMware environments usually requires expensive special solutions or add-ons. And, like flow sensors, VMware sensors are included in PRTG's range of functions. 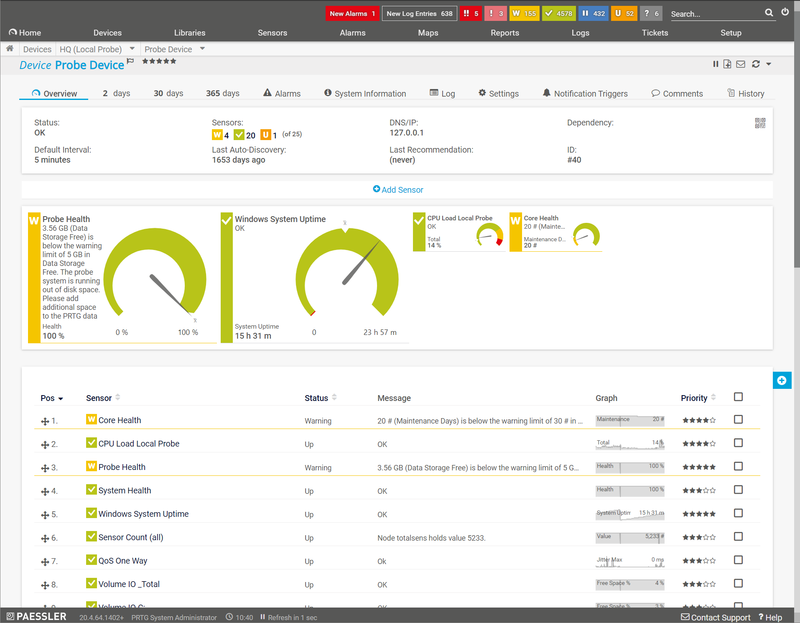 PRTG 100 can be used to augment VMware's integrated monitoring with an alarm and reporting tool. 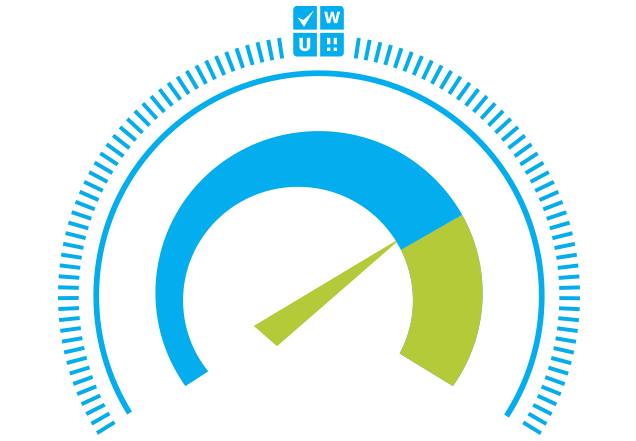 Over dedicated VMware host sensors, PRTG can read out and process comprehensive performance data. In addition, PRTG can also monitor the hardware on which the VMware host operates. PRTG Sensor "VMware Host Performance (SOAP)"
By creating an SNMP Traffic Sensor for each of your most important end devices, you can keep a constant eye on all the traffic in your network. 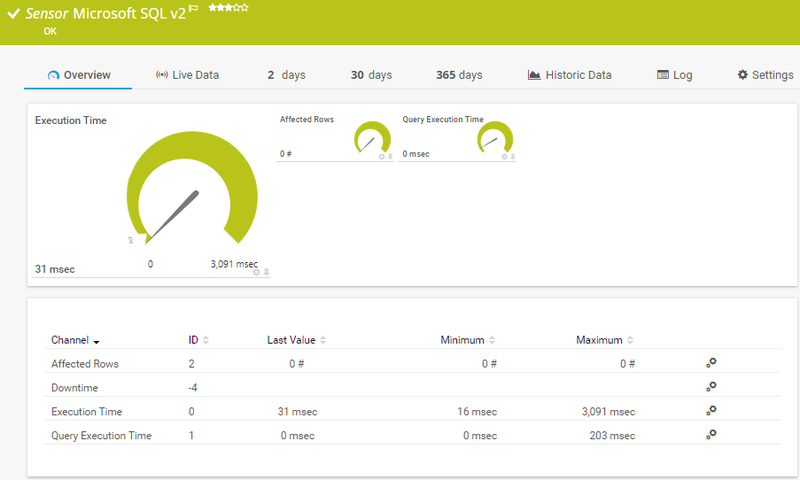 SNMP monitoring lets you determine if and when a device has become overloaded – or is about to reach its maximum capacity. In the event of disruptions or downtime, you’ll be notified at once. You want to know your ping time? Then try our FREE ping test and we show you how to fix high ping times e.g. of your website by reducing number of HTTP requests, adding Expires or Cache-Control Header, and utilizing a CDN to reduce latency. We’ll give you your ping time from 5 locations and help you to improve it.